NDP Leader Thomas Mulcair called the comments from last year "totally unacceptable." 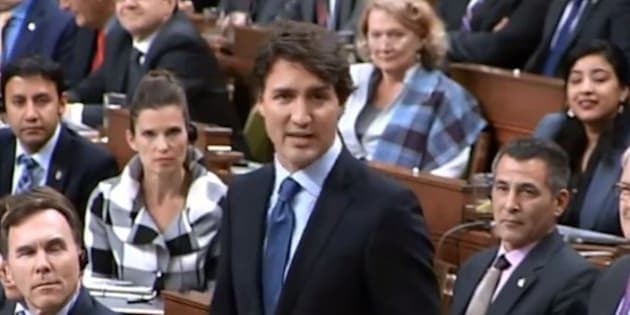 Justin Trudeau didn’t have much to say Monday after the NDP demanded the prime minister ask his newly appointed clerk of the Privy Council to apologize for “totally unacceptable” remarks he reportedly made about university students last year. NDP Leader Thomas Mulcair rose in question period to say that, as a member of the board of governors at Carleton University, Michael Wernick likened a group of students peacefully protesting tuition fees to "Brownshirts and Maoists." Trudeau said he was "very pleased" to name Wernick as Canada's top bureaucrat, and praised the veteran civil servant's "long career in the public service." “And we look forward to working with him to renew the profession and nonpartisan public service,” Trudeau added. A report published Sunday resurrected the incendiary comments Wernick reportedly made after students, equipped with a loudspeaker, interrupted a board of governors meeting with a 20-minute protest last spring. This 20-minute student protest shut down today's meeting of Carleton University's Board of Governors. According to Press Progress, Wernick — then-deputy clerk of the university’s board of governors’ privy council — responded to the protest by characterizing strategies utilized by students to those of Nazis and communists. “It has no place in a lawful democratic society – it is the tactics of Brownshirts and Maoists. It has no place in a university – it is the antithesis of free speech and open debate,” Wernick wrote in an April 1, 2015 email. The school’s Graduate Students’ Association (GSA) called for Wernick's resignation. Carleton later approved a tuition increase. Mulcair’s scrutiny of the clerk of the Privy Council on Monday marks an unusual move because the top bureaucratic role is regarded as non-partisan. Trudeau announced Wernick’s appointment to the role in a new release from Davos, Switzerland last week. He replaces Janice Charette, who was appointed by former prime minister Stephen Harper. Trudeau praised Wenick as an “outstanding” leader in a statement. Wernick has been involved with federal public service since 1981 and most recently served as Charette’s deputy. In the past, he has worked closely with Aboriginal Affairs and Northern Development.